High-Voltage Direct Current (HVDC) merchant transmission lines allow trade across separate power markets and often in different countries. Flows on existing cross-border lines are often assessed as suboptimal, which may be due to the light regulation that often prevails in these cases. This paper studies the impact of market power on HVDC interconnections as a determinant of imperfect arbitrage. We assess the impact of Physical Transmission Rights (PTRs) allocation on the management of an HVDC interconnection between a thermal and a hydroelectricity market, assuming dynamic water management. We use a two-stage game formulated as an Equilibrium Problem with Equilibrium Constraints (EPEC) to model the strategic trade between the New York (US) and Quebec (Canada) systems. The numerical model is calibrated with public data. We find that although the interconnection can create wealth, a high concentration of PTRs can destroy value because of dumping strategies. The impact of trade on local price levels may be of concern and calls for the functional unbundling of traders and generators. Proceedings - Under What Conditions is HVDC Conversion a Cost Effective Way to Increase Transmission Capacity in an Existing HVAC Corridor? 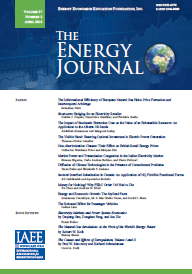 Published in Volume 39, Number 6 of The Quarterly Journal of the IAEE's Energy Economics Education Foundation.